Ordinary tween life turns upside down when Ancient Egypt intrudes on modern middle school life. Twelve year old Sara Guadalupe Bogus reads about adventures, but unexpectedly is drawn into one when a mystical emerald ring that once belonged to Cleopatra becomes stuck on her finger. A series of burglaries spook Sara’s small Ohio hometown. Concluding that the root of all the crimes is the emerald ring, Sara realizes it’s up to her and her friends, Heidi and African exchange student Kainu, to save the town and protect Cleopatra’s legacy. Filled with magic, the ring thrusts Sara into a world filled with nightmares, allows her to shape shift into an Egyptian cat and battle assassins. My name is Dorine White. I graduated from Brigham Young University with a BA in Humanities. I am a member of the SCBWI, ANWA, LDS Storymakers and the PNWA. I write middle grade and YA fantasy. 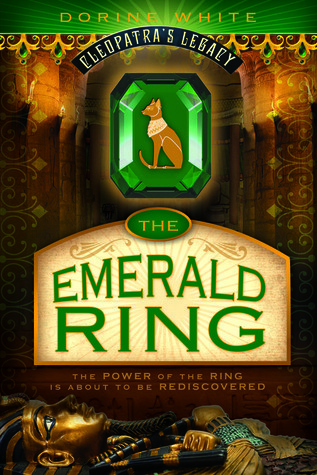 My first book, The Emerald Ring, was published May 2013 by Cedar Fort Books. This really sounds like a very interesting and entertaining fantasy book. I think my granddaughter would enjoy reading this. I find the Cleopatra character very interesting. Thanks for having the giveaway. Based on the summary of this book, I'm definitely going to read it ASAP! This sounds like a great deal of fun, and book #2 of this series looks just as good. I love reading middle-grade stories, and I also love reading fiction that takes place in Ancient Egypt, so this is like a two-fer for me. This sounds like a really fun adventure! I love all the magic that's included in the book. By the small taste that's included in the summary, it sounds as if this is an action-packed magical, fantasy adventure that my children will love. Thank you for including me in your giveaway! What a beautiful book cover! I love emeralds. My engagement ring is an emerald with diamonds on both sides.